Working with SprutCAM Robot does not differ much from the standard method in SprutCAM. If you are planning a project, follow the same steps as with a standard SprutCAM project, supplemented with some robot-specific steps. However, because the robot has at least one additional axis and a strongly different configuration, a number of functions have been added compared to working with a 3-, 4- or 5-axis machine. This makes working with SprutCAM Robot more complex when working with SprutCAM. It's very important that you start working with SprutCAM before you start with SprutCAM Robot. These include a number of issues that are essential for working with SprutCAM Robot. In this manual, we use the Stäubli robot with turntable in the image next to it. We focus on the setup of the robot and the assignment, and streamline the project. It is also explained how to optimize robot movements with the help of '6th axis control' and the 'robot axes map' and prevent singularity. As we work with a turntable, there are two machine tools in the schedule. Depending on how to edit your workpiece, using the turntable, or in another position, the model must be moved to the desired position. You also specify which zero point you want to use. If you have imported a model, SprutCAM places standard output material around. However, it is also possible to define the starting material, in most cases this also happens. You can create sketches in SprutCAM 2D in 2D Geometry. For example, you can use these sketches later in this case to specify boundaries in the job assignment. One of the ways to move the axes of the robot is using the Machine Control Panel. You can start creating the edits. Based on the geometry and type of operations, the position of the robot during the testing will have to be adjusted. In addition, we will optimize robot movements using the Robot axes map and 6th axis control. This is to ensure that the robot's movements are as efficient as possible during the production process, and to prevent him from getting into a singularity. For 5- and 6-axis (robot) milling, the tools must be aligned, as can be done in SprutCAM using the Align Tool. By clicking in the Align Tool in the direction you want to edit, the tool is oriented in the right direction. If you click on run, the toolbars are generated, usually there are red exclamation marks behind the operations. This implies that the operation still needs to be optimized. 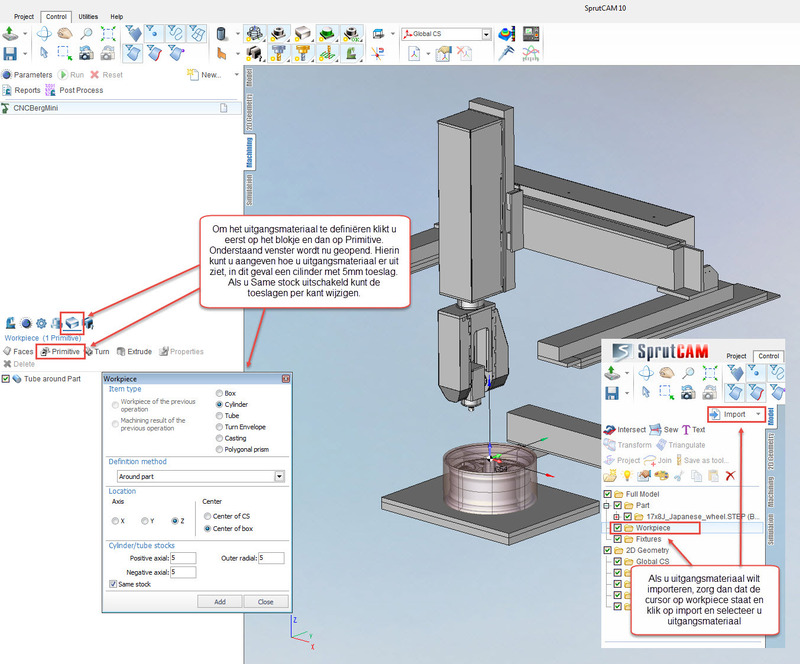 In 'Working with SprutCAM', you learned where and how to customize the operation, in 'Working with SprutCAM Robot' we will focus on streamlining the robot's movements. Once all the preparatory steps have been completed, the project can be simulated. It is very important that you see only green vectors behind all movements, and no red exclamation marks. In the project below, this looks good, but if you first simulate a project it's never good at all. For example, things like step size, input and output or other parameters can be adjusted in the operation itself. But in the Robot Setup, you may find incorrect settings that cause problems, or in Job assignment, things like Job Zone, Top and Bottom Level, or Restict Zone can be modified. Whenever you have modified the project and the toolbars re-generated, you can simulate the project again, and then adjust until all red exclamation marks are gone. Since we are focusing on optimizing robot movements from now on, I'll go deeper into the concept of singularity. In addition to collisions and movements that fall outside the robot's reach, you must prevent your robot from entering a singularity. Singularity can be detected in SprutCAM during the simulation of your project. With the help of the 'Robot axes map' you can clearly see where and when the singularity occurs. You can calculate the 'Robot axes folder' a new route, but it can also be manually. You also have the option of adjusting the state of the robot, and the method of working in 6th axis control, to eliminate singularity. If you are going to work with a robot you get to singularity. If a singularity arises, that means your robot has come into a state that he does not really know what to do. This can be expressed in the form of uncontrolled movement, or no more movement. In more detail, singularity entails the following. Some positions within the working range of the robot can be achieved through an infinite number of positions of the robot's axes of movement to position and orient the tool. These positions, known as single points (singularities), constitute a problem in calculating the robot arm angles based on the position and orientation of the tool. Generally speaking, a robot has two types of singularities, with respect to the arm or to the wrist. Armamentularities are axis configurations in which the pulse center (the intersection of axes 4, 5 and 6) is exactly above axis 1. Polarularities are axis configurations with axis 4 and axis 6 lying on the same line, i.e. if axis 5 makes an angle equal to 0. In SprutCAM Robot, you can use the '6th axis control' and the 'robot axes folder' to prevent your robot from entering a singularity. In the screenshot below, you will see the robot axes folder displayed from the first operation. As you can see, the robot can perform the operation safely without collisions, singularities or movements falling outside its reach. This is of course not always the case. The project must be streamlined on a regular basis. The Robot axes folder is a great tool for visualizing and adjusting the robot's movements. You can automatically create a folder for SprutCAM, but you also have the freedom to do this manually. Another way to prevent singularity, or to allow a robot to execute a particular project within its range is with 6th axis control. In SprutCAM there are two possibilities to automatically position the 6 axes of the robot, 'Direct to point' and 'fixed vector'.